Every spirit has a story. That’s the slogan at Heritage Distilling in Gig Harbor. Truly living up to the heritage in their name, most of the stories at this Washington state craft distillery surround family, and they’re more than happy to treat you like family when you’re there. 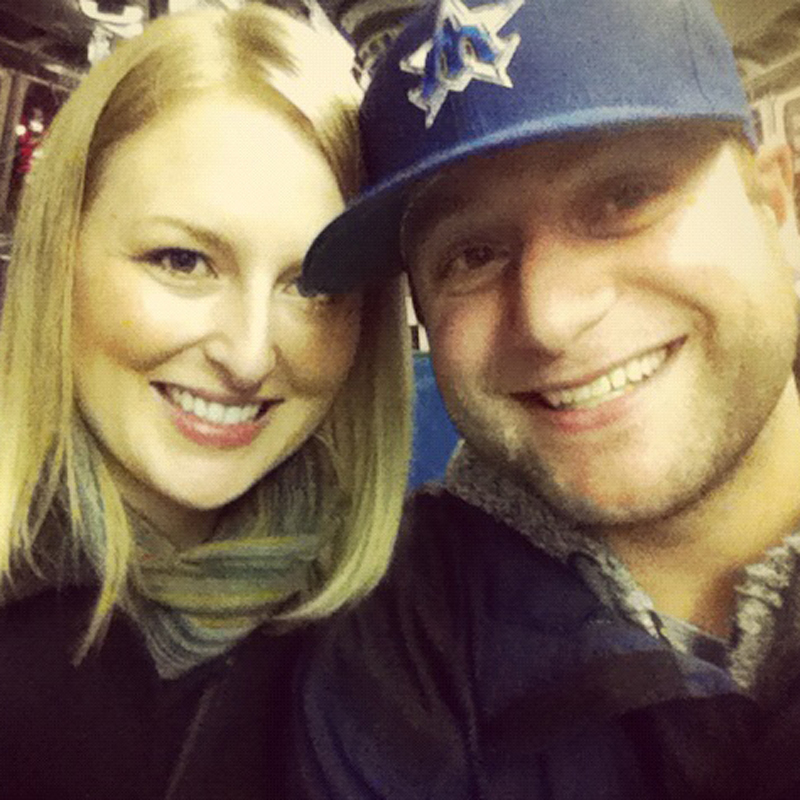 The owners of Heritage Distilling, Jennifer and Justin Stiefel, have interesting pasts. Generations ago, Jennifer’s family domesticated elk in the southwest Washington town of Quinault. In the tasting room, there are old photographs of Jennifer’s family actually sitting on an elk. That’s where the name for their series of Elk Rider spirits came from. As for Justin, his family has a history in the lumber business. Every piece of wood you find in the distillery’s shop and tasting room comes from the same tree that Justin purchased locally in Tahola. 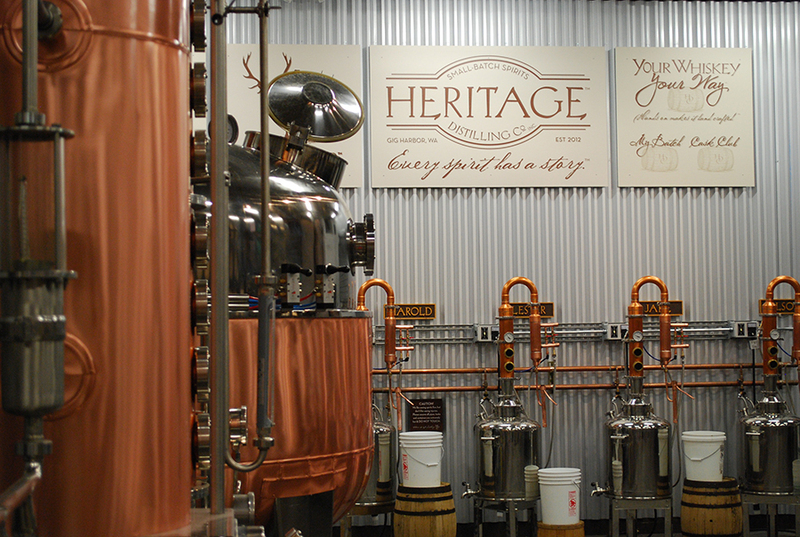 The couple clearly takes pride in their family history, and that history helps draw you into the experience at Heritage Distilling. I’m a dude, so when I think of booze, I think of rough and rigid. That’s not what the experience is like at Heritage Distilling (which I really appreciated). The tasting room is warm and welcoming. The best feature is the open wall that allows you to look down on the actual distillery. Surrounded by casks full of alcohol, the tasting room might remind you of something you’d find in a winery (it’s classy). There’s nothing rough and rigid about it at all. One .5-ounce chilled shot glass at a time, you get to try several products Heritage Distilling has to offer. We tasted their Triple Distilled Vodka (which is made from grapes), Char Barrel Finished Vodka, Soft Gin, Commander’s Rye Whiskey, Elk Rider Blended Whiskey, and Fall Classic Apple Cider Whiskey. The Soft Gin and Fall Classic were so good that we bought bottles to take home with us. I was also a fan of the Commander’s Rye Whiskey, which has an interesting story as well. Little do most folks know (at least we didn’t), but George Washington distilled his own whiskey at his Mount Vernon home in Virginia. Heritage Distilling based their Commander’s Rye Whiskey on the same recipe our first president used in 1797. The unaged, clear whiskey tastes very raw with rye, corn, and earthy notes. It’s pretty neat to think Washington and his fellow countrymen tasted something very similar more than 200 years ago. After our tasting, we were invited to tour the entire Heritage Distilling building. From the 2,000 pound sacks of wheat to the labeling, we were introduced to every step of the distilling process. Believe it or not, Heritage Distilling does everything (scooping wheat into machines, bottling, etc.) by hand. Figuring they crank out booze to Trader Joe’s and several local restaurants, that’s a lot of work for a small amount of people. With that said, it makes each bottle that much more special. 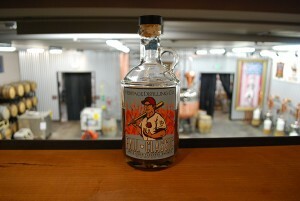 Heritage Distilling is proud to be from Washington. To be a craft distillery in our state, 51% of their ingredients have to come from Washington. 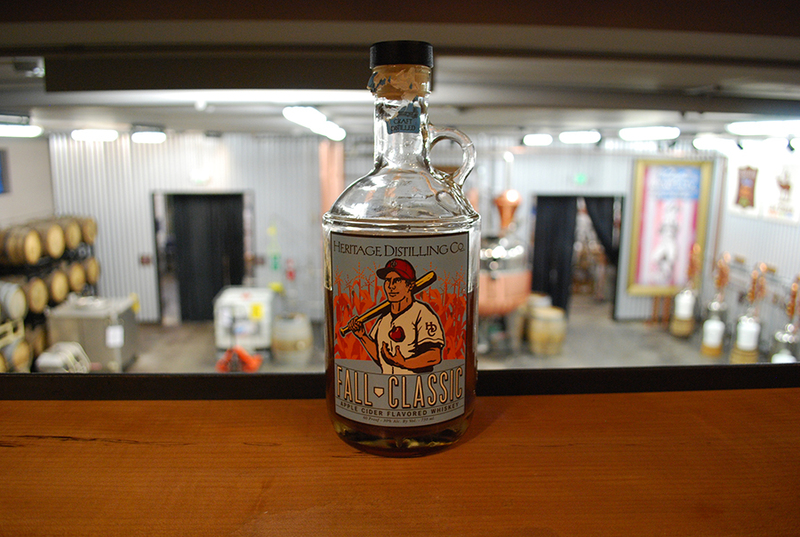 That’s why many of their bottles boast: “Distilled from grains sourced from Washington family farms.” Since agave and cane sugar aren’t available locally, Heritage Distillery can’t venture into tequila or rum (until they expand operations out-of-state — which is happening soon). 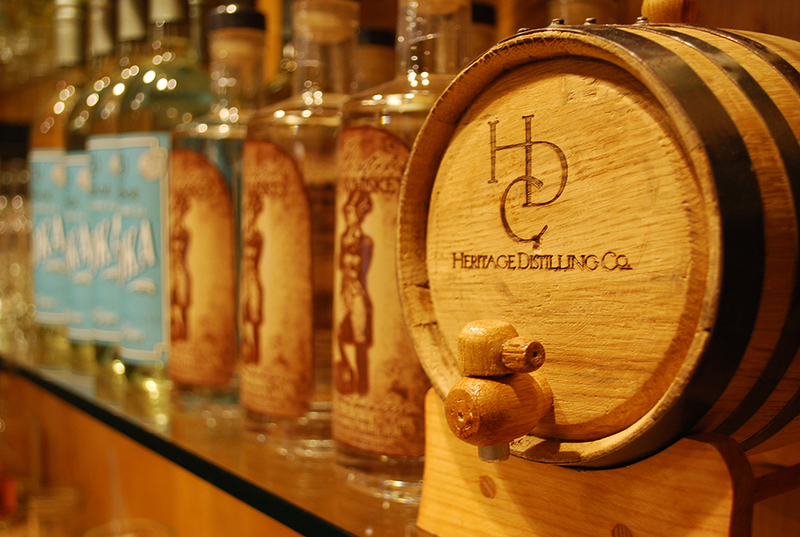 On top of tasting, there are several other fun ways you can experience Heritage Distilling. You can make your own whiskey in one of their My Batch sessions (the only distillery in the country that legally offers this), or you can join their Cask Club. As a member of the Heritage Distilling Cask Club, you get your own 10-liter oak barrel full of the booze of your choice. You get to determine what proof the alcohol is, how long it ages in the barrel, and much more. In other words, you get to make your booze your way. You can also purchase 2-liter casks to take home and age alcohol yourself. Tove and I weren’t really sure what to expect when we visited Heritage Distilling, but we were more than pleasantly surprised by our experience. From the incredible staff to the tasty booze, we couldn’t stop talking about how much fun we had long after we walked away. 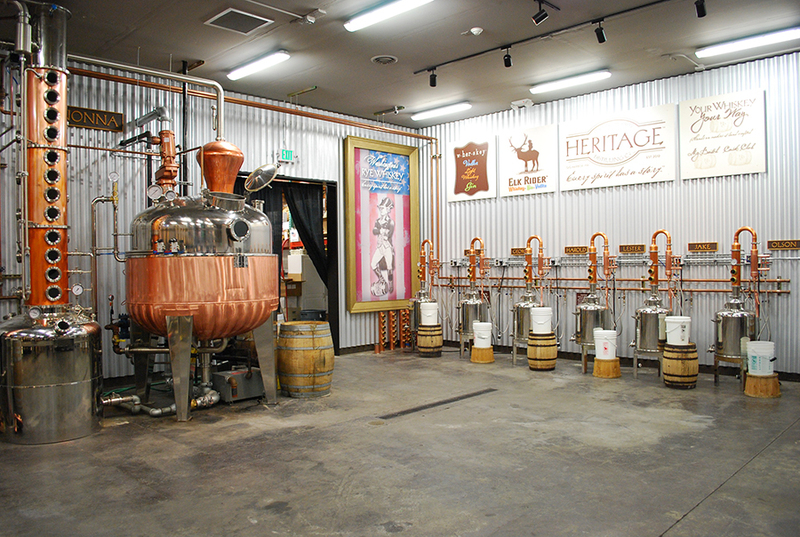 We’ll definitely go back in the future and we would recommend the Heritage Distilling experience to anyone heading to Gig Harbor. You’ll have a blast! Oh yeah, and don’t forget to tell them the Seattle Bloggers sent you! 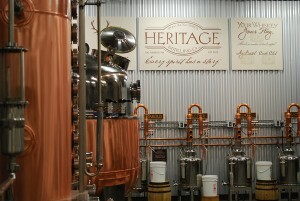 Have you ever visited Heritage Distilling? Do you have a favorite Heritage Distilling booze? We’d love to hear from you! Please leave a comment below or connect with us on Twitter, Google+, and Facebook. You can also check out Seattle Bloggers for more fun activities around the Puget Sound!